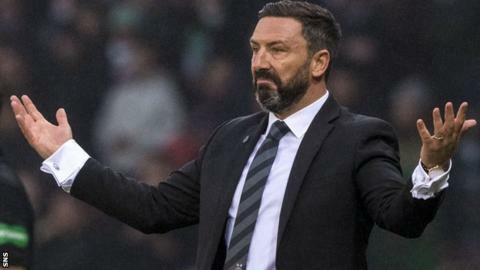 Derek McInnes is "pretty sure" he will win another trophy as Aberdeen manager after his team lost Sunday's Scottish League Cup final to Celtic. McInnes led the Dons to glory in the competition during his first season in charge four years ago. Aberdeen have since contested three finals - one in the Scottish Cup - and been defeated by Celtic in each. "I intend to come back to another final with Aberdeen and I intend to win another trophy," McInnes said. "While you can never say with any certainty, I'm pretty sure I will, regardless of how other teams are doing." Former Reds loanee Ryan Christie scored the only goal of the showpiece having finished a season-and-a-half stint at Pittodrie in the summer. McInnes revealed Aberdeen "thought we would" sign Christie permanently and had even kept his "favourite number 22" clear. "We've missed his creativity at times and that little bit of nous," added McInnes, whose side are seventh in the Scottish Premiership..
"We were well down the line to maybe getting him but Celtic made a good decision to keep him and give him encouragement to stay and Ryan's taken his chance." The Dons finished the final with two teenagers on the pitch in Lewis Ferguson and Connor McLennan, as well as 20-year-old Bruce Anderson and Scotland defender Scott McKenna, 22. "Days like today, it doesn't do them any harm in their development. I know you want to shove a winner's medal in their hand and celebrate," McInnes said. "But sometimes that resilience needs to be created and that extra determination not to have a similar outcome in the future. "We'll get back to finals at Aberdeen. As difficult as it is, I'm pretty sure these young ones will eventually become winners."